In this article we can see about submitting a form using twitter boostrap modal . Twitter bootstrap contains a modal which has responsive features and beautiful CSS styles. Here modal is referred by div id “form-content” which is basically hidden while loading and the form is referred by class “contact”. The below code will submit the form to process.php file and shows the processed results in the “thanks” div . The below php code will get the values from the form for processing . I have been looking around for a solution like this for hours. Muchly appreciated. 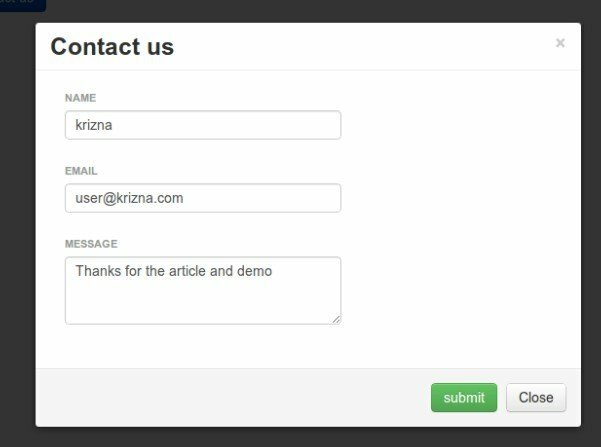 How would you call the Ajax from a form to start off with and then get the Thanks message (succces) from the process.php to appear in the modal? hi krizna is there any easy way to add Validation? kind of solution example code.. Thank you so much for this validation demo. I have been looking all over for an example just like this. You saved me. Hi Krisna. I send the data to a php controller and if I return an error I want to be able to display it in the same modal and hide when the controller returns a valid input. How can I do that? Thank you so much , This was a great tutorial. Is there a way to hide the submit button after a successful registration? I use a double opt-in signup and put the return messages from my signup script in the same modal just above the form. When I get a successful signup I show the message “Please go and check you email” and would like to remove/hide the submit button, otherwize if the click again they get a “This email is already registered” message. where do i put the email were i want the message to be delivered? you should have tested it before posting? My process.php can’t get POST data from other include file. It’s problem..
How valide data inputs ? How can vilidade its ? How validade its fields inputs ?